Google Alerts - Visitors can discover the artistic sophistication and visual splendor of South Arabian art through Faces of Ancient Arabia: The Giraud and Carolyn Foster Collection of South Arabian Art, on view at the Walters Art Museum, July 20–Sept. 7, 2008. Southern Arabia—now the Republic of Yemen—played a crucial political and economic role during antiquity through the trade in incense and exotic goods, such as spices and fragrances. In biblical times, the territory was known as the Land of the Queen of Sheba, the fabled monarch of one of several kingdoms that ruled the Arabian Peninsula. Faces of Ancient Arabia includes almost 100 ancient sculptures, statues, relief carvings and inscribed blocks—drawn primarily from a recent gift to the Walters of 61 pieces from the Giraud and Carolyn Foster collection. The Fosters lived in Yemen during the early 1960s, where Giraud was the personal physician of Imam Ahmed, the last king of Yemen. The mostly alabaster artifacts in this exhibition date from the sixth century B.C. to the fourth century A.D. To complement these ancient works, the exhibition will also feature paintings and drawings by world-renowned contemporary Yemeni artists Fuad al-Futaih, Hashim Ali Abdalla and Mohamed Zaidan as well as photographs of the country’s landscape, architecture and people by Detlef Michael Noack, retired professor of art from the Academy of the Arts, Berlin. The exhibition will include two- and three-dimensional representations of bulls, antelopes and ibexes—which were likely associated with the gods—funerary sculpture known as stelae, statues of worshipers and ritualists, commemorative monuments and inscribed blocks to memorialize the dead and worship the gods. The generous support of Kathryn Coke Rienhoff has helped to make this exhibition possible. Ancient Greek and Roman authors wrote about Southern Arabia’s immense wealth, huge temples and precious statuary. They marveled at its towering, multi-story houses—the first skyscrapers—and elaborate irrigation systems, including the first known high dam. The ancient Arabian kingdoms, particularly those of Saba’, Qataban, Ma’in, Hadramawt and Himyar, flourished from the eighth century B.C. to the fifth century A.D. The figurative and decorative art of ancient Southern Arabia evolved over a period of at least 1,200 years. Indigenous types and styles developed, although some motifs could have been inspired by the cultures of trading partners, especially when the art increasingly reflected Hellenistic and Roman influence. South Arabian sculptors worked primarily with indigenous stones, particularly calcite-alabaster and limestone. Ancient civilizations could have associated the translucent quality of the calcite-alabaster, a cream-colored stone, with sunlight. When South Arabian art first became available on the international market, buyers were enthusiastic about the highly polished, structured pieces. Due to this appeal, illegal excavators and some art dealers cleaned pieces before they were sold, making reconstructions very complicated. Of the works from the Fosters’ collection, the alabaster heads and other statuary pieces are not in their original state. The brightly colored exteriors with inlays are absent; instead, only the alabaster stone surface is present. Today curators and conservators can try to reconstruct the faces by examining the less-polished, smooth parts of the surface, which had been painted areas. These parts usually included the hair, eyebrows, eyes and sometimes the mouth, which were all colored by natural pigments of black, red and yellow. Additionally, the eyebrows and eyes of some statues had inlays of shell, glass or semi-precious stones that did not survive due to theft or loss. Most of these inlays and nearly all of the paint are gone, but the faces are still impressive. Exhibition visitors will have the chance to explore these facial reconstructions on a computer, learning how the objects originally looked. In the exhibition, the work of a Stela with Female Bust (1st century B.C.–1st century A.D.), is one of the best of its kind and was probably produced in one of the premier ancient South Arabian workshops. The stela displays the upper torso of a woman emerging from a kind of roundel with an inscription on the base, naming the man who donated the piece to the temple. The figure has raised her right hand, in a gesture of blessing or intercession, and holds in her left hand a wheat bundle, a symbol of fecundity. The interpretation of such female images is still controversial—it is either a priestess, who intercedes to the divinity on behalf of the donor, or one of the very rare human-formed representations of a deity. The stylized figurative works produced in the early centuries have timeless—even modern—qualities. For example, Head-Stela with Stylized Face in Raised Relief (6th–3rd century B.C.) 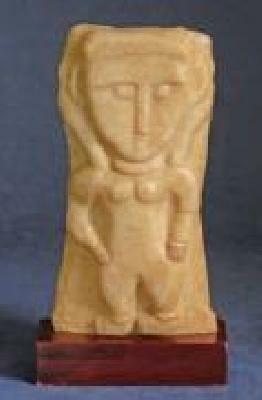 has a highly-stylized, flattish face with features in raised relief, reminiscent of modern art. Sculptured funerary heads and heads carved on stelae were placed into pillars with niches in the entrance areas of tombs and represented the deceased. Only a very few examples of this earliest type of head-stela have been preserved. This exhibition will also tell stories of contemporary Yemenis through drawing, painting and photography. Fuad al-Futaih is one of the most famous Yemeni artists. He is known for his experimentations with different materials and colors as he boldly portrays women. He also creates murals, sculptures and graphics as well as children’s book illustrations, stamps and coin medals. Al-Futaih studied art history at University of Cologne, Germany and art at the Academy of Fine Arts in Dusseldorf, Germany. He has exhibited in France, Italy, the United States, Japan and Egypt. In 1989, he received the National Award of Fine Arts from the Republic of Yemen and founded the contemporary art “Gallery no. 1” in the capital of Yemen, Sana'a’. Two artists who worked and exhibited with him in this gallery are Hashim Ali Abdalla and Mohamed Zaidan. Their works are also well-known in Yemen. In particular, Zaidan’s paintings are so popular that they appear on postcards.